Time Management Portfolio - Crouser & Associates, Inc. So what do you do all day? Stuff is what most say. But we can’t tell what we’ve accomplished but we do know we never got the important things done. If only we could just get some “heads down” time, we could work on an important project, getter done and then work on the next one. That’s “project time” and we never will “find” it, we must “make” it. But how? 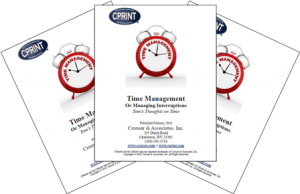 I created the CPrint® Time Management Portfolio of tools and a most excellent explanation that describes the real problem which is, “interruptions.” This portfolio includes my most excellent explanation along with the CPrint® Weekly Time Planner (customizable to your needs in an Excel.xlsx format) as well as a sample time planner illustrating the time plan for the small shop owner who is everything: production manager, sales manager and finance guy. Doesn’t get more complex than that. And, also included, is a recommended Time Log (TimeLog.xlsx) should you wish to use it. It’s one of the easiest ways for anyone to keep track of their time along with a sample illustrating how to use it. This product is a *.zip file which is delivered to you immediately containing *.pdf and *.xlsx files (see RECEIPT for your download link), report is 6 pages with 2 forms and samples.